Select Channel Paid Search Social Email Affiliates Referral Display Other Advertising Organic What is Channel and why this is mandatory? 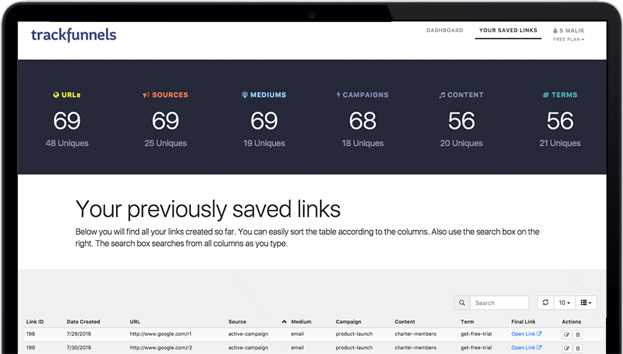 Channels determine how your traffic sources are grouped in your Google Analytics reports. It's important to define your channels so when you look at the Multi-channel reports your traffic is grouped the way you want. A Channel in Google Analytics has rule-based definition. When you choose a channel, we use Google Analytics rule based definitions to populate appropriate mediums for you. That way, you or your team do not have to remember these rules. Plus, it'll help keep your nomenclature consistent and you can't make a mistake. If you would like to disable Channel for your account or want to keep it optional, please contact us and we'll make it happen for you. Try to describe the content where this link will be placed. Assign keywords. Useful when split testing or paid keywords. Need help? [email protected]. Copyright © 2017 TrackFunnels. Made with lots of in Berlin, Germany.